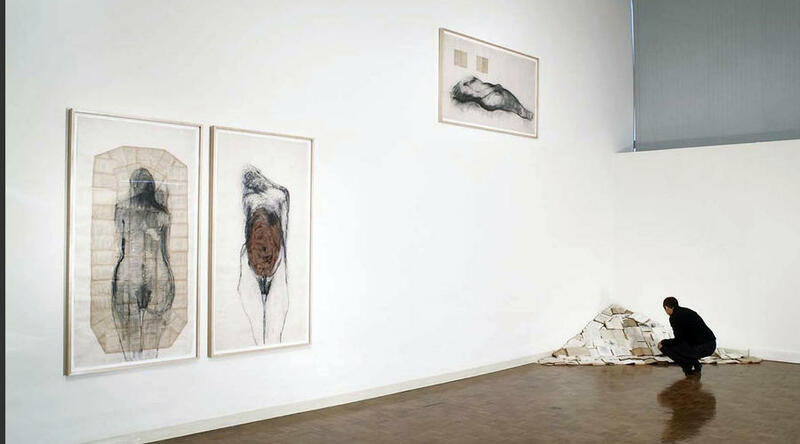 Monika Weiss' survey exhibition at the Lehman College Art Gallery is her first ever such retrospective show in the New York region, and includes recent performance installations and an overview of her work from 1999 onward. The renown of Ms. Weiss, who is Polish-born and based in New York, has endowed this event with considerable stature -- especially among performance artists and those who follow performance art. The exhibition's title, ''Five Rivers,'' refers to the five rivers in Greek mythology that are believed to separate the world of the living from Hades, the world of the dead, and through which one must pass to achieve eternal life. Ms. Weiss is clearly fascinated by this transition, and something of her fascination is evident in ''White Chalice (Ennoia)'' (2004), an installation consisting of a video image of her curled-up body projected into a medieval baptismal font filled with water. It is as though she were back in the womb, about to be reborn, yet heavy with time. Or perhaps she is flirting with the dark glamour of death, and the nerve-racked promise of life on the other side. ''Ennoia'' is the general title of a series of works in which the artist immerses herself for long periods of time in sculptured vessels filled with water. 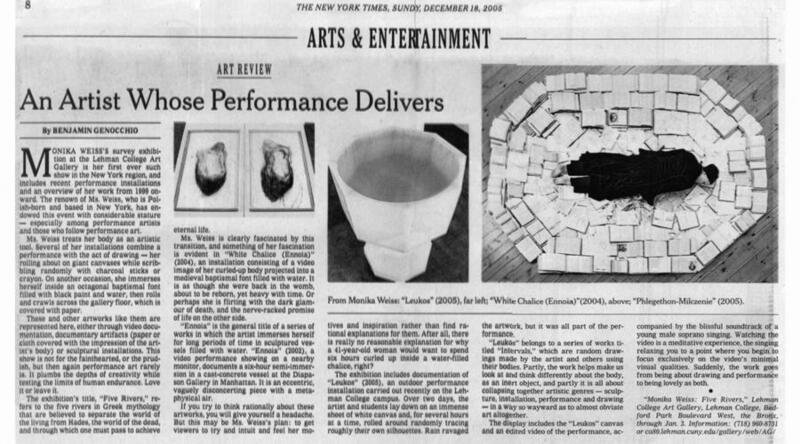 ''Ennoia'' (2002), a video performance showing on a nearby monitor, documents a six-hour semi-immersion in a cast-concrete vessel at the Diapason Gallery in Manhattan. It is an eccentric, vaguely disconcerting piece with a metaphysical air. If you try to think rationally about these artworks, you will give yourself a headache. But this may be Ms. Weiss's plan: to get viewers to try and intuit and feel her motives and inspiration rather than find rational explanations for them. After all, there is really no reasonable explanation for why a 41-year-old woman would want to spend six hours curled up inside a water-filled chalice, right?The exhibition includes documentation of ''Leukos'' (2005), an outdoor performance installation carried out recently on the Lehman College campus. Over two days, the artist and students lay down on an immense sheet of white canvas and, for several hours at a time, rolled around randomly tracing roughly their own silhouettes. Rain ravaged the artwork, but it was all part of the performance. ''Leukos'' belongs to a series of works titled ''Intervals,'' which are random drawings made by the artist and others using their bodies. Partly, the work helps make us look at and think differently about the body, as an inert object, and partly it is all about collapsing together artistic genres -- sculpture, installation, performance and drawing -- in a way so wayward as to almost obviate art altogether. The display includes the ''Leukos'' canvas and an edited video of the performance, accompanied by the blissful soundtrack of a young male soprano singing. Watching the video is a meditative experience, the singing relaxing you to a point where you begin to focus exclusively on the video's minimal visual qualities. Suddenly, the work goes from being about drawing and performance to being lovely as both. Photos: From Monika Weiss: ''Leukos'' (2005), far left; ''White Chalice (Ennoia)''(2004), above; ''Phlegethon-Milczenie'' (2005).